Lost somewhere between lunch and getting home to dinner these drones make their way, en mass, to the pantry to microwave their little bags of popcorn goodness. But most of them failed "following directions 101" and do not read the bag where is says "Listen for popping to slow to 1-2 second between pops" indicating that their sack of hot munchies is properly prepared. They instead just hit the microwave industry's dirty little laugh button labeled "popcorn". This button has actually been known to make the machine 10 times as powerful as the owners manual would have you believe it could be. Yet, time after time, they saunter up and put their bag in, hit the popcorn button and walk away awaiting a beep. Which no doubt has to some degree burned their popcorn. Forcing me to smell it for the next hour or so. Anyone who works in an office knows the 3 o'clock carnival smell and how it can be downright annoying. Today I have successfully exacted my revenge upon all of those around me guilty of ruining my afternoon day after day by making the office smell like a second rate circus everyday. I struck back with bad intentions. I took a bag of popcorn from the communal snack area (trough) in my group. No wonder there is a weight problem in corporate offices. I then made my way to said pantry and hit the legendary popcorn button. And when it was done I hit that button again. I could smell the nastiness even before I opened the door. I took it out and walked around the center area of our floor. Making my way over to "The Mayor's" desk. I promptly opened the bag and placed it on his desk. It was nanoseconds before he realized what I was doing. Not that The Mayor necessarily deserves this treatment, but why not, his desk is in the center of the room and perfect placement for the popcorn of vengeance. Within a minute or two all you could hear around the office was banter about the crispified corn and how repugnant the smell was. I even received and email from Mrs. Hitachi who sits at the exact opposite corner of the room from me complaining that she has had enough of people not knowing how to operate the microwave. I have yet to respond to her email. I figure sending this should suffice. I feel that my point was made. 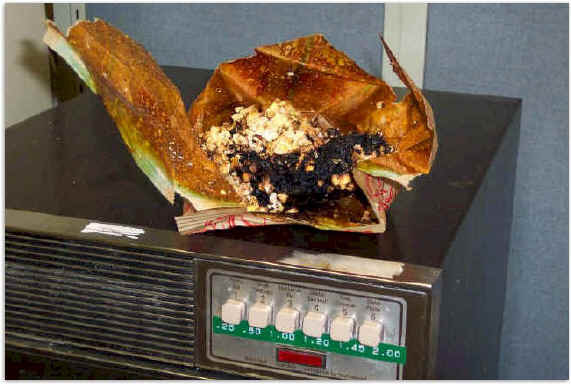 People may be more inclined to actually try not to burn their corn in the future. I feel that I have closed this chapter of vindictive behavior regarding these offenders. As for the innocent, well, lets just call them collateral damage. Seems to work for the government. You're my hero. Plain and simple. Keep stickin' it to the man. What happens when you're still smelling it on Monday? And I repeat... "Go The Duke!"